A display system made of stacked and suspended wooden boxes forms a signature feature in this new Blue Bottle cafe, which occupies part of a 1920s brick building in downtown San Francisco. Situated in the city's South of Market district, the cafe sits within a nearly century-old brick structure that once housed a Kohler plumbing supply warehouse. The coffeeshop occupies a storefront space that encompasses 1,200 square feet (111 square metres). For the adaptive reuse project, the team sought to create a light-filled interior with a minimalist aesthetic. Preserving the building's original elements was also a guiding concern. "The design reveals the site's inherent beauty by stripping away the frivolous and unnecessary, elevating the most essential attributes of the architecture, such as original brick walls and wood support columns, and enhancing the visible connection to the bustling SoMa streets," said Bohlin Cywinski Jackson, an architecture firm with six offices around the US. A defining feature is a wooden shelving system that stretches across the cafe. The system consists of different sized "floating boxes" that either hang from the ceiling or are combined to form full-height shelving units. "Bags of coffee and serveware available for purchase are nestled within the framework, creating an eye-catching merchandise display," the studio said. The service counter was fabricated from stainless steel and birch plywood. An under-the-counter Mavam espresso machine helps enables better eye contact between baristas and customers. Tables and seating are made of blonde wood, which contrasts with the dark, concrete flooring. "Patrons can sit and sip coffee on solid ash benches throughout the space, as well as banquette seating placed along the windows," Bohlin Cywinski Jackson said. The walls were painted pale blue, with one wall featuring a large version of the company's logo – a turquoise bottle. The store features Blue Bottle's first Cold Bar, which serves alcohol-free, cocktail-style coffee drinks. The Oji Old Fashioned, for instance, is made with cold brew, jasmine tea and hints of vanilla and fresh orange peel. This is the first cafe that Bohlin Cywinski Jackson has designed for Blue Bottle, with more planned for Boston, Miami, New York, Washington DC and additional locations in the Bay Area. The coffee company was founded in the early 2000s and is based in Oakland, California. 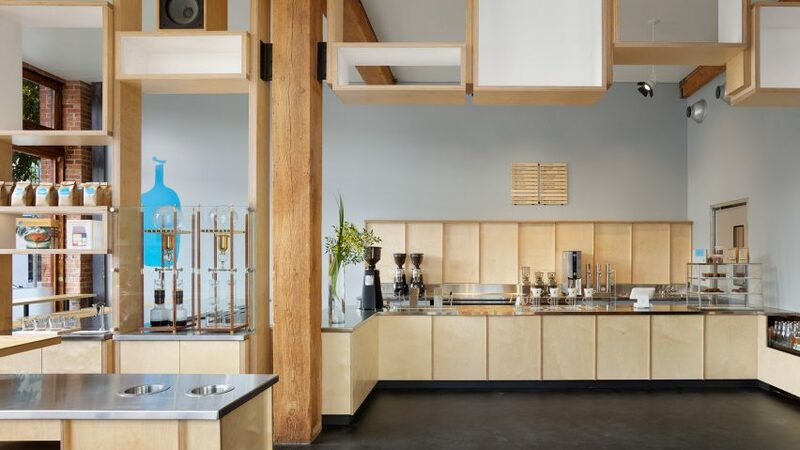 "Blue Bottle understands the value and role of good design, and wants to make their store experience match the quality of their coffee," said Greg Mottola, a design principal with Bohlin Cywinski Jackson. "Their interest in maintaining the unique characteristics of each space, and using humble but beautifully detailed materials, is consistent with our interests in making great places for people." Other projects by the firm include Apple stores in Palo Alto and Lower Manhattan, and a series of cabins for summer residents studying at Fallingwater – the 1930s home designed by Frank Lloyd Wright.